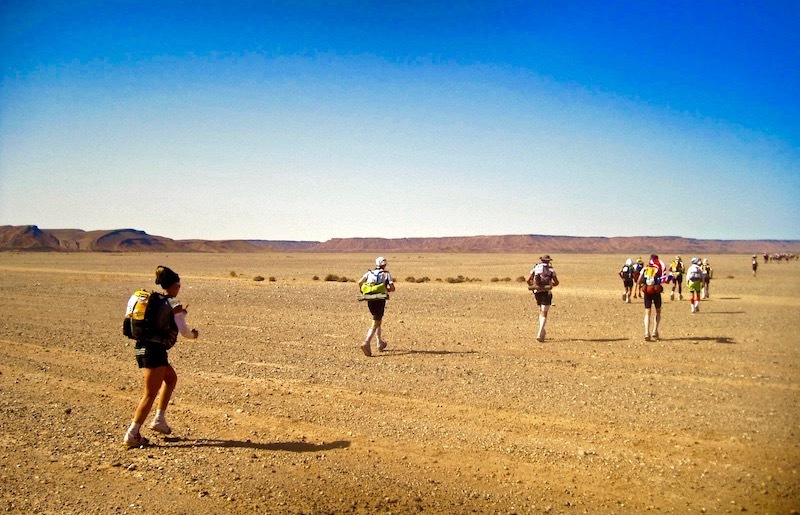 The Marathon des Sables. 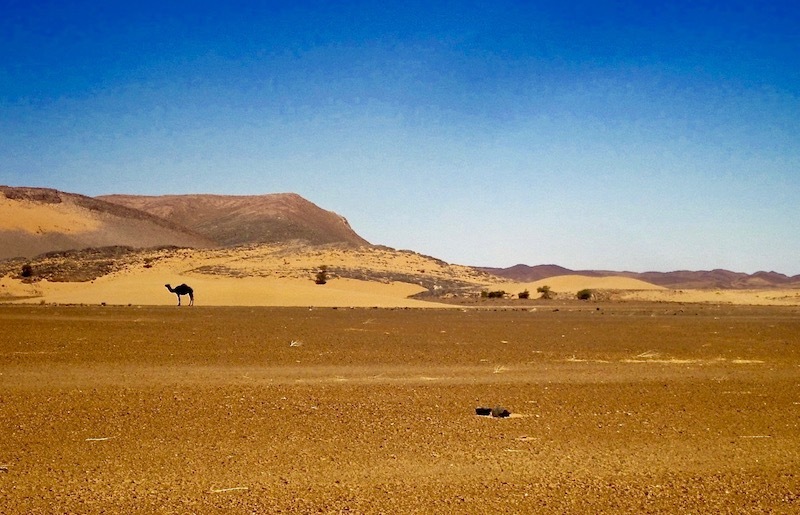 The name itself is synonymous with images of rolling sand dunes, the Saharan sun beating down and streams of runners slowly making their way across this record-breaking and gruelling 257km course. It is, however, the intricacies and spectrum of emotions that make it such a special event. The feelings of loneliness and helplessness at running out of water a few kms before a checkpoint. The mental turmoil of momentum and consistency being utterly evaporated in the searing heat. 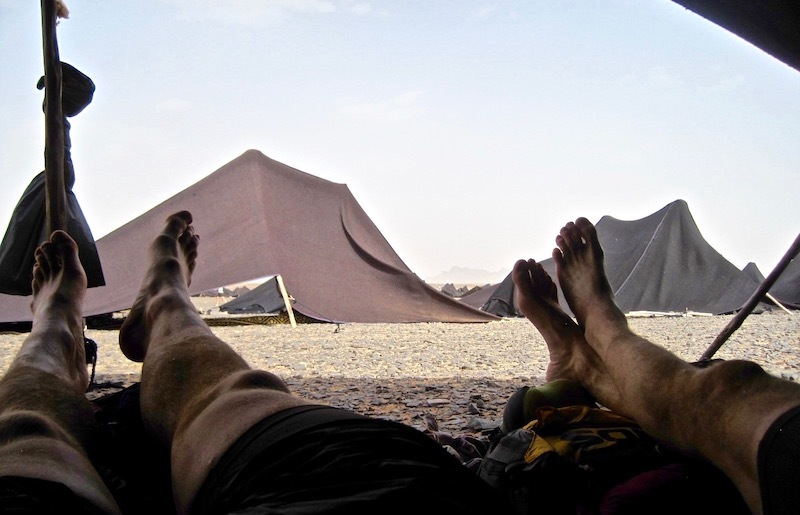 And finally, the joy and relief at reaching the end of a stage, lying down in your tent to recount stories only for the realisation to sink in that you have to do it all again the next day. I signed up for MDS on a whim when it seemed like a good thing to do. I found a trio of foolhardy teammates to become the first Light Dragoons to complete this iconic challenge. In April 2016, the four of us, all with fairly erratic, minimal and frankly ill-advised training plans, found ourselves at the MDS start line. Over 1200 competitors in a truly international event – competitors from as far as Thailand, Peru, Costa Rica and Somalia but heavily bolstered by a strong British contingent. On comes AC/DC’s ‘Highway to Hell’ in full volume, a countdown from 10 and then we’re off. The frantic early pace was somewhat thwarted when the first few km of dunes came into play. The initial excitement of trudging up and running down in your silk gaiters quickly evaporated and the realisation set in…this was a bloody big undertaking and I’m 5km into a 257km event. Over the dunes and straight into a sandstorm; pulling up a buff over one’s face and head down was the only approach. Up and down more dunes, across more salt flats and finally the campsite comes into view. A pathetically slow sprint finish ensues but Stage One and 35km was complete. Then comes that moment when all of us are settled into the seven-man tent, applauding each person as they beam/collapse their way on to the sand-filled tent floor. The amusing and bleak realisation we have the same thing tomorrow rears its head in conversation. That is temporarily sidetracked as the joys of lying down with your feet up and downing a recovery shake takes priority. MDS is a self-sufficient event, obviously minus water stations every 10km, so all those “nice to have” items are set aside. Toothbrushes are cut, loo roll rationing becomes a subject of intense debate (we didn’t get that one right at all) and grams/space are saved here and there. 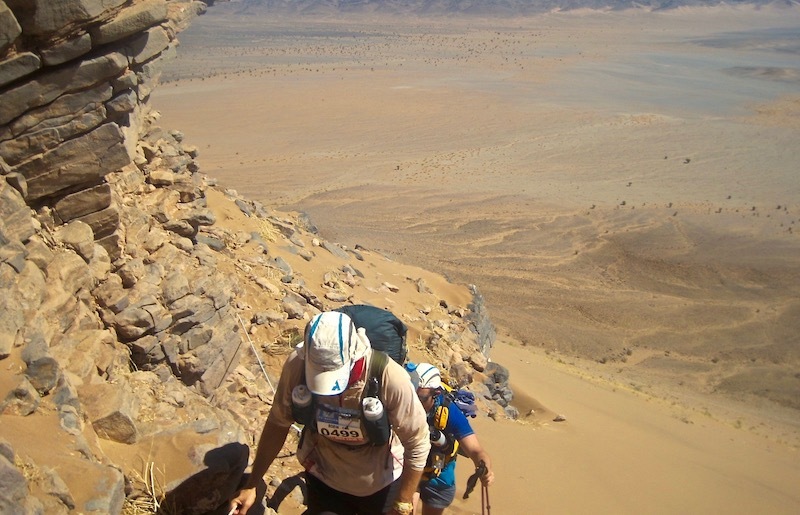 Running the MDS is a subjective term – each person adopts their version of the deceptively slow “Saharan Shuffle” – the speed at which you can sustainably move. Days two and three followed similar patterns. Wake up at 6 a.m., a group elongated refusal to get out of sleeping bags until the last possible moment, taping up blisters, counting the number of toenails missing, a little stretch before porridge and race start post-Highway to Hell at 8.30 a.m.
Then came the much discussed ‘Long Stage’ – a double marathon at 85km – on the back of almost three marathons already completed. Madness really. As it transpired, you just do the same as the other days – find a pace you can sustain, keep drinking, keep eating, fuel yourself for the long term not just the next 5-10km and move towards the next checkpoint. The water given was never enough and however many salt tablets I wolfed down, it was just never enough. What does this kind of dehydration look like? On an average day we were provided with 14ltrs of water yet still only managed to pee a deep yellow only a couple of times a day. The four of us arrived between 8.50 p.m. (12.5 hrs) and 2 a.m. (17.5 hrs) enabling a decent sleep combined with stretching and resting the following day. Knowing we had a full 42km marathon on the final day was a bugger but didn’t detract from the satisfaction at finishing that Long Stage. A final marathon it was though and our acclimatisation ensured the pace was upped a bit on the whole. That final day was great as we made our way through the main body – the top 200 start 90 mins after everybody else showing how well we had placed as a team. Passing some of the unique participants before finally crossing the 2016 MDS finishing line with arms aloft was a feeling and one none of us will forget. MDS is a unique experience like no other I’ve done before and one I would thoroughly recommend. Some people, including myself to an extent, were a little cynical before, seeing it as a bit commercialised and mainstream but that is totally missing the point! – Firstly, it’s a hell of a challenge. Whether you finish 50th, 150th or 950th, it will have pushed your body and mind to some pretty low moments across some truly stunning scenery in a relentless and unforgiving environment. – Secondly, yes, a lot of people take part in the event but wow that makes it special. It means you see and meet more remarkable people from all over the world with a story to tell, a new insight to give and a joke to share with. That is what events such as MDS are about – the people, the beautiful surroundings and the shared experiences with a special group. It brings about self-reflection, it breaks down barriers and test individuals which, more often than not, exemplify people’s resourcefulness, determination and courage. I’m extremely grateful for all the support we had for this attempt in aid of ABF. 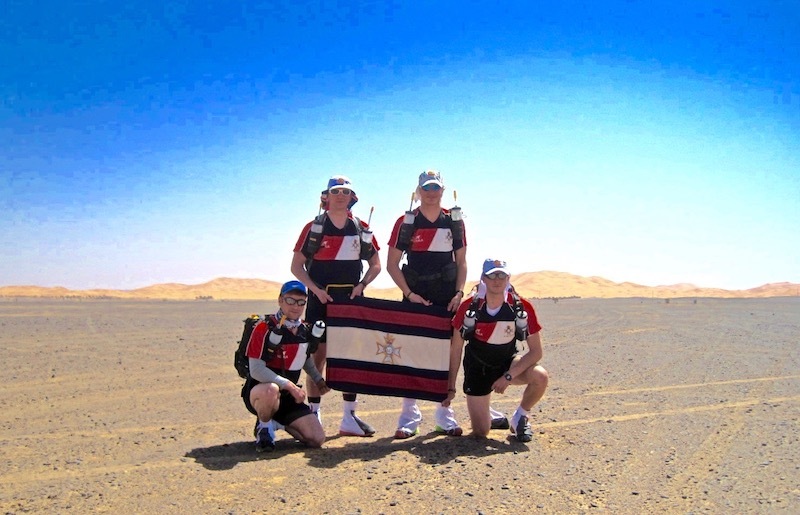 It meant a lot and to have four Light Dragoons cross the MDS finishing line with our Light Dragoons flag and our arms aloft was a proud moment.